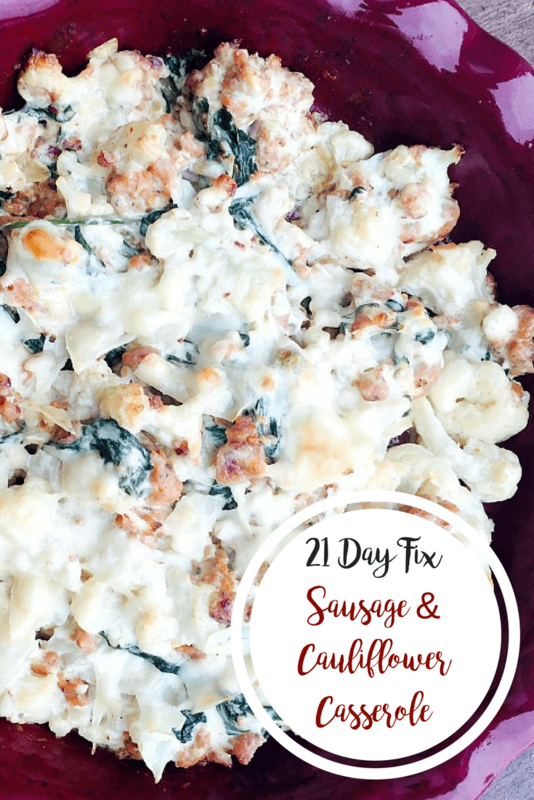 Sausage and cauliflower casserole is a 21 Day Fix healthy dinner recipe. 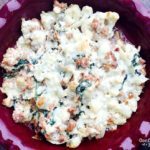 It’s rich and creamy, and filled with sausage, cauliflower, ricotta cheese, and some healthy greens. Confession #24- My recipe obsession can be a little costly, at times. And so I am making a conscious effort to utilize all my leftover groceries/ingredients into new, healthy meals. 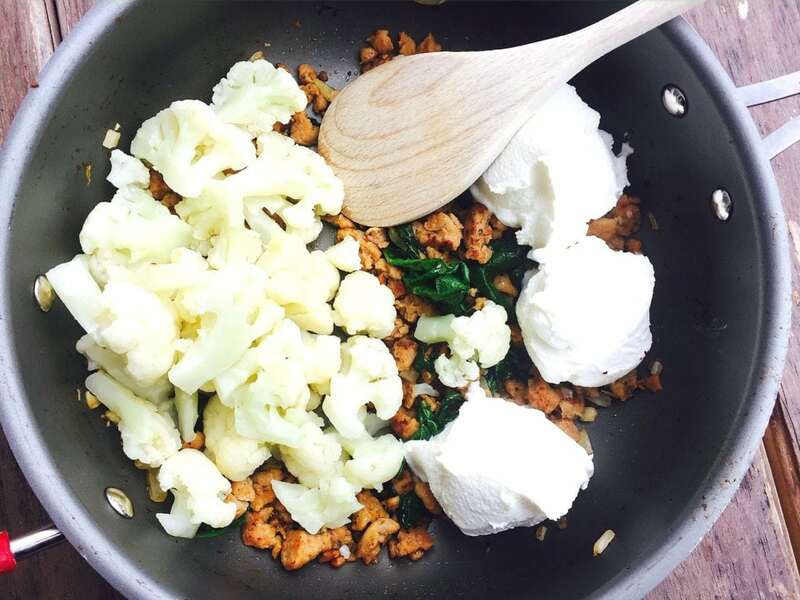 Last week, I had some leftover turkey sausage, a head of cauliflower, half a container of ricotta cheese, and some greens to use. So I put them to work. I was worried this would be a total fail, but I actually LOVED every delicious bite of this totally skinny, but sinful tasting sausage and cauliflower casserole! My husband, who was super skeptical, actually scraped the dish clean. And my one year old was all over it. He ate his own and kept sticking his little fingers in my plate, too. I can’t wait to make this easy casserole again! Bring water to a boil and cook cauliflower florets until they are soft. While that is cooking, coat a pan with cooking spray and brown turkey sausage. Add onions, garlic and green. Toss together and cook until greens start to wilt. Add chicken broth. Drain cauliflower and place back in the pot. Add turkey veggie mixture and the ricotta cheese. Mix together. Spray a casserole dish with cooking spray and add cauliflower turkey mixture. Top with Parmesan cheese. Cook at 425 for 10-15 minutes. I just wanted to thank you for this blog. I don’t normally do this but it has made a significant improvement on my life. I started the fix 2 weeks ago and found I was eating the same chicken and salad/wrap every day. I didn’t start it to lose weight but to learn to be healthy. I was discouraged because I didn’t think there was any way this could be a life style change for me. 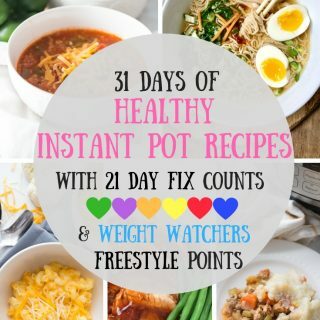 Then I stumbled on your blog and decided to restart the 21 days with these great recipes and meal prepping my priority (I also have a 2.5 year old and a 9 month old). I’m on the third day and I’m actually excited to make dinner. Anyone who knows me well knows this was my most dreaded task of the day. I can see this ad a life style change for me and my family. 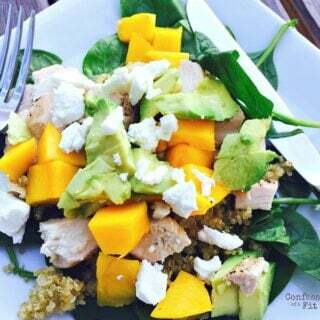 Clean eating is easy when it’s delicious and quick food. This made my night! Thank you SO much for taking the time to write me; I am thrilled my recipes have made a difference for you! I believe in what you said – healthy eating can be delicious AND simple! Many thanks!!! What is a serving size of this? I see its 1 green and 1 red and 1/4 blue. But when combined it’s hard for me to figure it out. Is it like 1 cup equals those portions and is a serving size? Hi! This serves 4, so if you divide the casserole dish into 4 portions, you will be all set! Hi there! Just wanted to confirm if the casserole dish size is 8×8? Thank you! what does the red, blue and green mean? For those who follow the 21 Day Fix, these are the color coded containers for this recipe. That makes me SO happy!!! Love a dinner that is healthy, tastes great and works for the whole family. Thank you for the great feedback! Has anyone tried to freeze this already cooked? I have been looking for recipes that go with the 21 day fix program that lso provide serving size and container equivalents. Thank you so much for doing this for such a great tasting recipe. I put a handful of kale in. How much greens do you suggest? Hi! I think when I first created this recipe, I only had 1-2 cups of greens in the fridge, but you can easily make this with 2-3 cups…which is what I usually do now! So happy you found me :). Good luck with the program and let me know if you need any more help! Would you think frozen cauliflower would be okay to use? I haven’t tried it, but I think it would work fine! Just be sure to drain it very well! this was soooo good! mine was a little watery so i would have maybe cooked another 10 mins in the oven (and i like my cauliflower a little crispy on top! I wonder if you could broil it for the last couple of minutes? Glad you liked it!! This was absolutely delicious! Everyone in the family lived it and it kept mama on her plan!! Thank you!! I dont have any ricotta, do you think i can substitute greek yogurt? Do you have cottage cheese? I don’t think yogurt would work. Thanks for the reply. I went ahead and stopped at the store for the Ricotta. Family enjoyed the dish. I do keep cottage cheese in the refrig, so maybe I will try with that next time. Thank you for the new recipe! So happy they liked it! Cottage cheese would work great…I should update the recipe to state this. Thanks for the comment!! The Beachbody recipe for ricotta is super easy and its only 3 ingredients. Also I have 2 toddlers and forgot to portion this out BEFORE I served them and my husband and now I have no idea what the portions would be with what I have left. Any idea? About how much sausage is 3 reds? I made this this past week, and used the entire pound of sausage! I left out the broth and used cottage cheese instead of ricotta, I also put hot sauce on it to give it a little zip!! By far my favorite recipe I’ve found for 21 day fix!!! Thank you soooooo much for sharing!!! WOW! I need to try it your way! Thank you SO much! Silly question about the sausage. I bought turkey sausage links. Is that the kind you used? Yours looked more of the crumbled kind. Can’t wait to try this recipe! I also buy links, but I remove the casing! You could also slice your sausage if you would like…slightly different texture, but still would yummy. Enjoy :). Ok thanks so much! I’ve seen the sausage crumbles sold in the stores and it looks easier but probably not as healthy? I think it’s Jimmy Dean..
Yeah – I would stick with a lean, all natural sausage! And taking off the casing is super easy, I promise! Made this for supper tonight and loved it. Next time I’m going to try roasting the cauliflower and the garlic. Super quick weeknight dinner. I’m so happy to hear, Karen!! And I love the idea of roasting the cauliflower and garlic – please let me know how that goes!! Just made this tonight to have for my dinners for the next couple of days and oh my goodness – I couldn’t stop picking at it! It did come out pretty watery but it certainly did not hinder the flavors – it is definitely the change in my meal line up that I needed to stay on track! YAY!!!! I am so happy to hear that!!!! This fits great in an 8×8 pan or even a pie plate :). Would this work with the cauliflower crumbles? Like Cauliflower Rice? It might! It might be like a risotto type thing – YUM! Yes, I mean the cauliflower rice! I would try it!! Report back and let us know!! Hi! Can you tell me approximately how many sausages you used for 3 reds worth? Thanks! Can’t wait to make this! I would love to make this and freeze for quick dinner some nights! How exactly would I go around that? I think it would be great! I think you could freeze before baking or after…and then heat it in the oven. If you try it, let me know! I made this on the weekend and froze it. I will let you know Thursday how it is because it’s on my lunch plan! Hi! Just discovered this recipe! Wondering if I could use chicken sausage links instead of turkey sausage crumbles…? You sure can! You can take them out of the casing, or just chop the sausage. Both would be great! 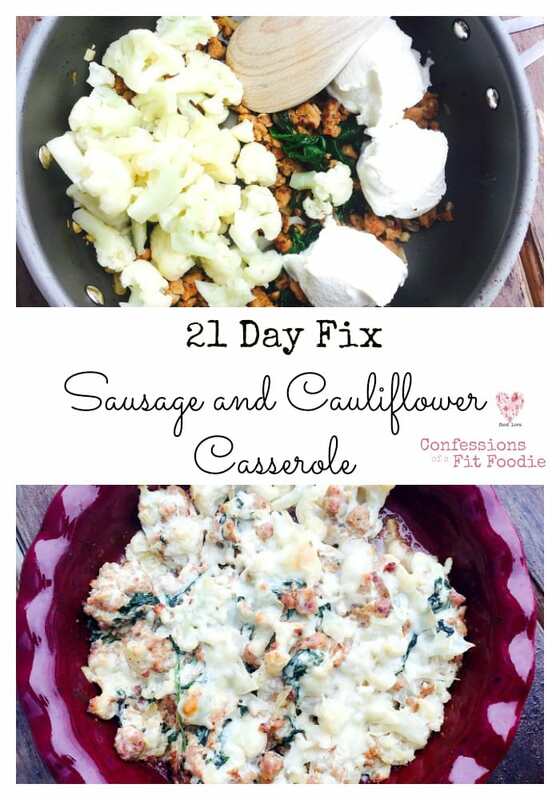 I don’t do the 21 day fix but I do enjoy new recipes and this sounds delicious! How much sausage is considered 3 reds? You could easily use a pound of sausage or regular sized package! We LOVE this one – especially my husband! I’m in need of a crock pot recipe for a large camping trip. 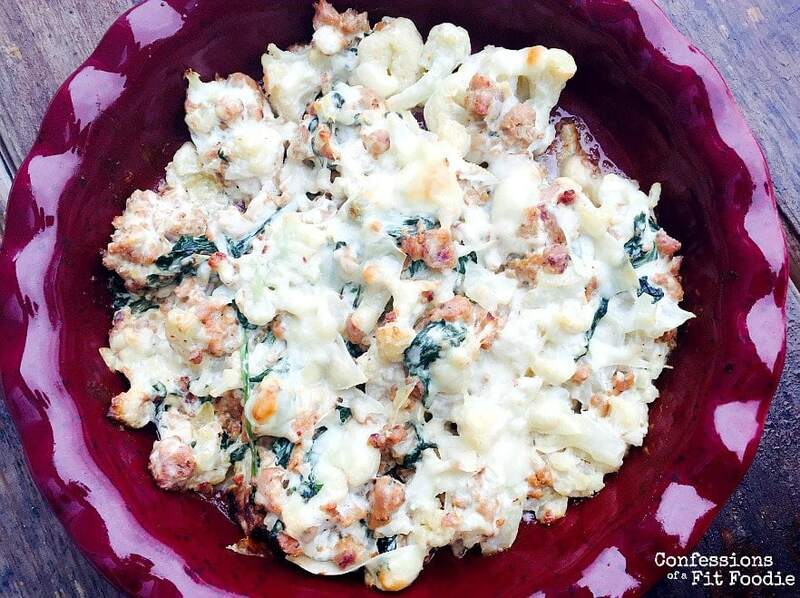 The sausage cauliflower bake is one of my favorite meals. Has anyone tried making this and reheating by crock pot? I don’t want it to get too mushy. But thought this would be a great one to make a head of time and just plug in. Any idea of the calorie content? Thanks! I’m not sure, but just log it into my fitness pal and divide it by 4 servings! Hope that helps! I made this tonight for dinner and it was really good. I didn’t add the chicken broth simply because I didn’t have any. I added salt and pepper and I think next time I will add crushed red pepper flakes. I used link turkey sausage and was able to squeeze the turkey out of the casing. Also, I added a whole tub of spinach. It was very yummy! Thank you for the new recipe that I will add to my regular lineup! That’s great! Also good to know it’s ok without the broth – I might leave it out next time to try it! So happy you enjoyed it! YES!!!!! I am SO happy to hear this! This is one of our favorite recipes, too – we love it and I will definitely try adding some tabasco sauce, too! Thank you for making my day! Is it a spicy breakfast sausage flavor? Or like a hot Italian type sausage? No ricotta on hand–think I can use cottage cheese? I did this as a weight watchers meal and used reduced fat Parmesan, low fat cottage cheese, and turkey sausage. Worked great. Made this for my daughter who is just starting the 21 Day Fix. I do have A few questions…. 1) Ricotta: Non-fat Ricotta? Skim-Milk Ricotta? Whole Milk Ricotta? 1A) And does it change the amount of a particular color per serving if one uses whole milk vs non-fat? 2) I think “3 Reds Worth” of sausage is equivalent to 2 1/4 cups of meat? (If a red container is 3/4 of a cup?) Yes? No? 3) Is one suppose to strain/rinse off the grease generated in cooking the sausage? I’ve cooked it and will portion and freeze it for her. I nibbled a bit and it is delicious! I’m going to make it for myself, even though I”m not on the program! And thank you for answering these questions! Hi Beth! How awesome it is that you are helping your daughter! She will do great with your support! Ok – so 1. I usually use the part skim, but for this time, I would count it as a red regardless! 2. That’s perfect! 3. If you have a lot of grease from the sausage, then I would definitely drain it. I use a very lean poultry sausage and it’s not super greasy. Hope these answers help!! Thank you Nancy for another great recipe! My husband and I both really enjoyed it! We roasted cauliflower and red pepper but did not add the chicken broth. I think next time we will add maybe 1/4 C Chicken Broth. It was not watery at all, but I think its because the cauliflower was roasted, not boiled. We also used Cottage Cheese instead of Ricotta. We will be having this again sometime for sure! Thanks for all you do!! YUM!!! I LOVE that you used roasted cauliflower!!!! Sounds SO good!!! Made this tonight and LOVED it. I will 100% make this even when I’m not on the 21 day fix. Amazing how this somehow satisfied my pasta craving without actually needing the pasta! This made my day, Laura! Thanks so much! Is this recipe gluten free? I make it all the time for me and my b=husband, but was going to make it for a friend who is gluten free. When my husband said- “ok, let’s eat healthy”- I knew I couldn’t feed this ‘meat and potatoes’ guy chicken and veggies for dinners. I saw this and had to try it. I’m going to admit I was skeptical… I used Greek Yogurt instead of ricotta and added a teenie bit of Asiago with my Parm. To say we were loving it, is an understatement. We are fighting over who gets the leftovers for lunch! This is seriously fabulous. The flavors. The textures. The ease. 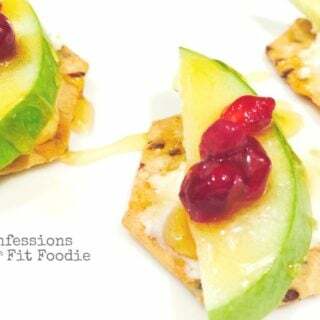 Thank you for giving me (and my slowly changing husband) an amazing place to turn to for healthy, fabulous dinners. Would this work with frozen califlower rice instead? I buy organic califlower rice at Trader Joe’s by the truckload since it is super convenient and lasts for a long time. If so, what would you think would be the amount you would substitute for the califlower florets? I’m a 2B mindset former Fixer so love your recipes! Hi! I would still use the same amount of cauliflower regardless of the form! I do think it will work! YAY!!!!! I get it, Cindy! I was skeptical while I was making it, lol! Sooo good! My husband is currently on a Keto diet and I’m struggling to make things that the whole family will enjoy and that he will eat. This hit all the marks! Everyone loved it! I used 2 lb. of Italian sausage, 1 c onion, 4 cloves garlic, a whole head of cauliflower, 4 cups chopped kale, 2 cups ricotta and 1 cup chicken stock. Added a little salt and pepper at the end. Baked it in a large 10×15 Pyrex. Made enough for 2 dinners for my family of 5. So quick and easy! So delicious! Thanks a bunch for sharing! This is awesome, Kelly! And so good to know – I have a lot of people asking for keto recipes! Thank you so much for taking the time to comment – means a lot to me! I cannot say enough good things about this recipe. I have been eating it for breakfasts this week. Not only was it delicious the first day, but it has reheated great. I used some fresh breakfast sausage and added just a pinch of crushed red pepper. This will definitely be going into regular rotation. Oh my goodness, Meghan! This blows my mind!!! I never thought of it as a breakfast meal, but WOW!! Thank you so much for leaving such a great review and sharing this amazing idea! Where do you find spicy sausage?